PATRIOT, a global leader in performance memory, SSDs, gaming peripherals and flash storage solutions today announced the immediate availability of its new VIPER RGB Series Performance DDR4 Memory Kits. PATRIOT's VIPER RGB Series memory modules are designed for users who are obsessed with maximizing hardware performance without compromising stability. The VIPER RGB series are fully optimized for the latest Intel and AMD platforms and matched with a stunning heat shield design. VIPER RGB series offers RGB illumination control through a software application without additional cables to maintain an aesthetic look and stunning visuals. PATRIOT VIPER is committed to providing product solutions for gamers and modders. RGB illumination is a significant element of a gaming PC now. VIPER RGB memory module features unique design elements, from the brow shaped light bar to the abstract "fang" design of the heat shield emulating our iconic Snakehead design. Each LED offers full spectrum RGB lighting for dazzling color effects. VIPER RGB series is fully compatible with the major motherboards' RGB control software apps, allowing the RGB Lighting to be synchronized between VIPER RGB memory and motherboard. 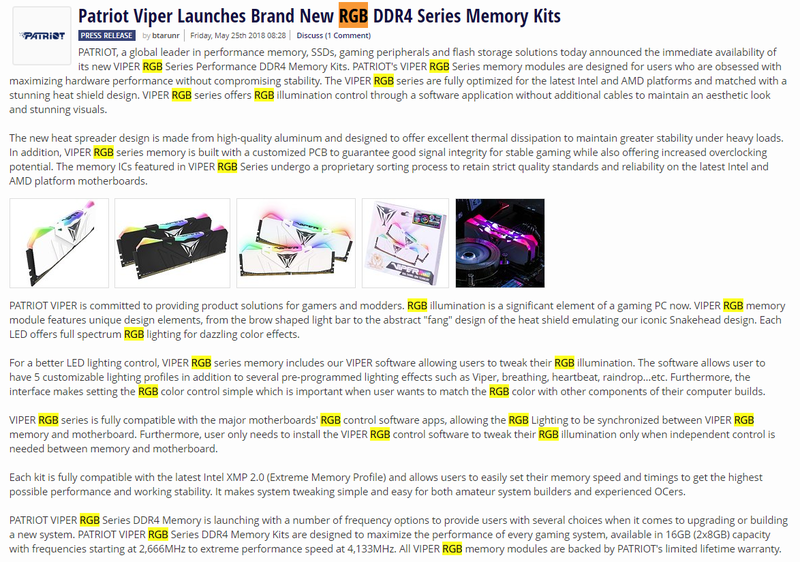 Furthermore, user only needs to install the VIPER RGB control software to tweak their RGB illumination only when independent control is needed between memory and motherboard. PATRIOT VIPER RGB Series DDR4 Memory is launching with a number of frequency options to provide users with several choices when it comes to upgrading or building a new system. PATRIOT VIPER RGB Series DDR4 Memory Kits are designed to maximize the performance of every gaming system, available in 16GB (2x8GB) capacity with frequencies starting at 2,666MHz to extreme performance speed at 4,133MHz. All VIPER RGB memory modules are backed by PATRIOT's limited lifetime warranty. Yeah its funny when you use the search function on this kind of text. The power of repetition man. Soon you'll wake up saying RGB and say a few prayers to the god of diodes. Can't wait fot this stupid RGB fad to die. I'd rather they leave out the RGB and reduce the price. I need more RGB for my closed cage which is underneat my desk!